Google Keep is one of my favorite Android apps. I use it for setting reminders and creating task lists on my phone. Occasionally, I'll even use it to organize my thoughts in a series of sticky notes. This week Google made Keep available as an iOS app. The iOS version of Keep works just like the Android and Chrome versions. 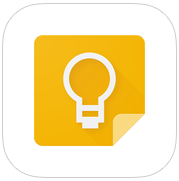 On Google Keep you can create sticky notes to use simple text notes, as bookmarks, or as reminders with dates and times. You can color code your notes and arrange them by dragging and dropping them into any order you like. And like most things in your Google Account all of the notes in your Google Keep account will sync across all of your devices. Using the color-coding aspect of notes in Google Keep could be a nice way for students to construct an outline for a research paper or presentation. Google Keep can be an excellent to-do list app for students. Students can color code notes, make lists, and share notes.